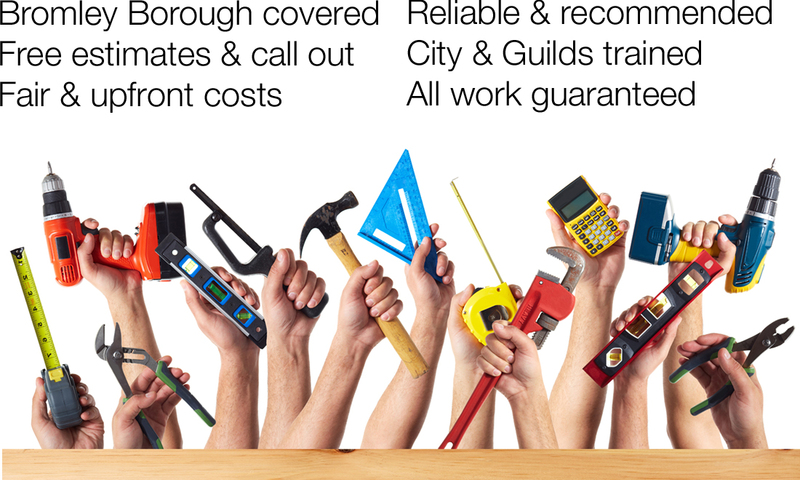 Are you looking for a rated, reliable handyman in the Bromley area? Are you looking for someone to take on all those odd jobs around the home that you just never get the time to get done yourself? Steve the Handyman Bromley can help you with a wide range of plumbing, electrical, decorative and handyman skills? Maybe you have just moved home and are in need of a handyman to hang pictures, shelves and build the odd flat pack unit? Or you need a dripping tap fixed and some plumbing help is what you need? Well look no further, Steve the Handyman Bromley can do all of these jobs to get your home looking tip top. All my rates are very cost effective and I pride myself on being reliable and on time. I carry out a wide range of handyman jobs including decorating, plumbing and basic electrics. Please see the list below and my handyman services pages for more detailed information and the full list of services. My rates start at £30 per hour, and this is the minimum charge for any job I attend, plumbing work is £40 per hour. If you intend to book me for a days work then prices start at £150, but please ask for more details. Bromley, Orpington, Beckenham, Petts Wood, Chislehurst, Sundridge Park, Crofton, Locks Bottom, Green Street Green, Farnborough and more. I cover the majority of the Bromley Borough and I am based in the Orpington & Petts Wood area, please refer to my service areas map for a more detailed list of towns I serve. Always be polite, friendly and helpful. Be on time and let the customer know of any delays as soon as possible. Make sure the customer needs are fully understood. Carry out all handyman jobs in a tidy and professional manner. Provide dust sheets for the customers furnishings, fittings and fixtures. Work within Health & Safety guidelines at all time. Resolve any issues fairly and quickly. Here’s some of the latest customer reviews of Steve the Handyman Bromley to give you an idea of the standard of service.